The LaHaye Ice Center services the student body of Liberty University and the greater Lynchburg area while playing home to the Liberty University ACHA Division I Men's and Women's hockey teams, ACHA Division II Men's and Women's teams, and the Men's Division III team. It is exciting to see Liberty's hockey teams competing against long time perennial powerhouse franchises such as Penn State, Rhode Island, and Oklahoma. 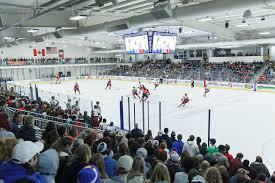 The Ice Center holds up to 4,000 fans at the Flames home games.